A 19-year-old South Carolina woman and her mother have been charged in the death of a newborn baby boy left in a trash can at the restaurant where each of them worked, police said on Wednesday. 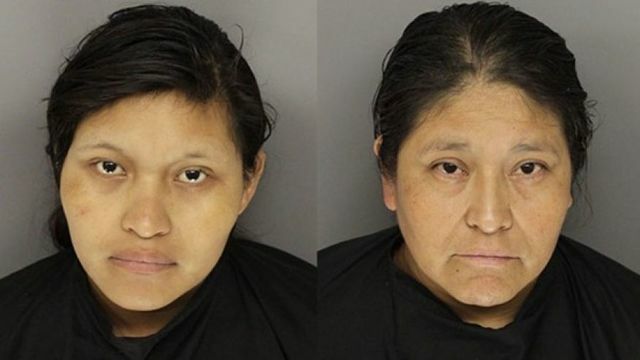 The mother of the baby, Estela Ruiz Gomez, and her mother, Lorenza Gomez Rodriguez, 41, were being held in jail without bond in Greenville, South Carolina, said Jonathan Bragg, spokesman for the Greenville police. The younger woman bussed tables at a Mexican restaurant and her mother washed dishes there, police said. Police charged the younger woman with homicide by child abuse, and the elder woman with aiding in that crime. The grandmother of the newborn was also held for federal immigration authorities because she did not leave the United States when ordered to do so in 2016, Greenville police said in a statement. The baby's mother gave birth in the restaurant's bathroom on July 12 and then left with her mother, police said. Shortly afterward, another restaurant worker took out the trash, noticing it was heavier than usual. "Because (the employee) was having difficulty lifting the trash bag, she dragged the bag across the parking lot, causing it to tear, and a newborn baby fell out of the bag onto the pavement," police said. Authorities said the newborn's father saw him fall out and took him inside the restaurant. The newborn was taken from the scene alive but died at a hospital, where the mother was also treated. After an autopsy found dirt and gravel on the baby's body, the medical examiner told police the baby had no health issues that caused his death. On Monday, the medical examiner ruled the death a homicide, saying the baby would have lived had he not been placed in the trash. Police charged the women on Tuesday.